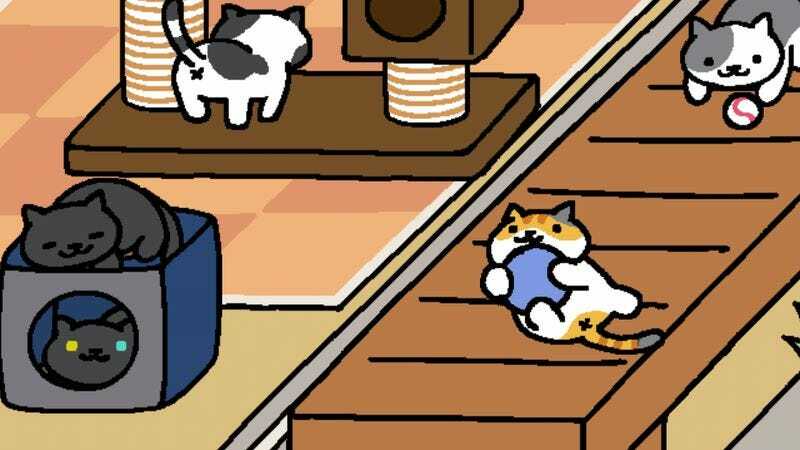 For those of you who aren’t already obsessed with the game, Neko Atsume: Kitty Collector is a Japanese mobile game of such staggering simplicity that it makes Candy Crush look like Bloodborne. It works like this: You put out toys and food to attract virtual cats to your virtual yard. They come, they play with the toys and eat the food, you take photos of them to put in your “Catbook,” and then they leave, presumably heading off to someone else’s virtual yard. When the cats leave, they give you in-game currency in the form of gold and silver fish, which you use to buy more toys and food in order to attract more cats. That is basically the whole game. And yet, in spite of, or possibly because of, its ease-of-use, the game is amazingly popular. It was named one of the top mobile games of 2015 by GameSpot, even though the English version of the game only came out in October. (Prior to that, English users guessed their way through the Japanese version.) Even the game’s creator, Yuta Takasaki, is confused by the popularity of his creation. I knew he had stopped by a few times over the last week because I saw the fish he left behind (he was, I thought, pretty stingy)—but I hadn’t checked the game in time to catch him while he was around and take a picture. It was infuriating. I couldn’t stop checking. Why wouldn’t the Chairman come when I wanted? I’d done everything right! The pot was out, the food was there. . . .
Ah, yes. Of course. My problem was that I wanted something from a cat. He points on that, much like the owners of real cats don’t so much “own” them as strike a food-and-shelter-for-companionship deal with them, you don’t really “collect” the cats of Neko Atsume. They just decide to hang out for a bit until they get bored of you.